Last year, I was invited to attend a ceremony dedicating a beautiful bronze sculpture crafted by African American Artist, Kevin Pullen (artist in residence at the College of Coastal Georgia). The ceremony was held at the Lodge at Retreat, sponsored by the College of Coastal Georgia and Sea Island Company, and was attended by local political dignitaries (including Mayor Harvey and members of both the County and City Commissions) as well as descendants of Neptune Small and Henry Lord Page King. Mr. Pullen was inspired to create this Bronze Sculptor after learning about the historical event of Neptune Small carrying the body of Henry Lord Page King all the way from Virginia, where he was killed in battle during the Civil War, back to King’s home of St. Simons Island, GA. The families, dignitaries and guests gathered to listen to Mr. Pullen as he recounted the story of Neptune Small. 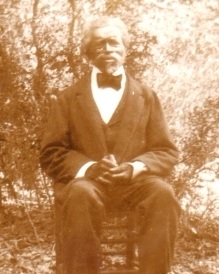 Neptune was a slave at Retreat Plantation on St. Simons Island during the time of Anna Page King, who ran the plantation in her husband’s absence. Her husband, Thomas Butler King was supportive, but was heavily engaged in national politics as a US Congressman and typically traveled away from the plantation, leaving Anna with the sole responsibility of Retreat. Anna ran the plantation with a strong hand and a soft heart – she cared for those working her land like family members, and she built a hospital for the slaves and taught them to read and write, even though that was against the law at the time. When Neptune was a young boy, Anna assigned him to work in the main house as a manservant to her son Henry Lord Page King, or “Lordy” as he was affectionately called. Lordy and Neptune were about the same age, and in the days just before the Civil war, they became inseparable friends - they hunted, they fished and spent a great deal of time together. When the Civil war broke out, Lordy King enlisted in the Confederate Army, and Neptune accompanied him as his manservant. At the battle of Fredericksburg, in Virginia, Lordy King was killed. When he did not return from the battlefield, Neptune put his own life at risk and painstakingly searched the battlefield until he found Lordy’s body. Instead of seeking to escape his status as a slave and pursue his own freedom, Neptune Small did something unthinkable: he personally carried Lordy’s body, traveling all the way from Virginia to Georgia so that Lordy could be properly buried at Christ Church, Frederica. At some point during Mr. Pullen’s moving presentation, I could not help but recognize a remarkable and almost palpable feeling of brotherly love in the room as we celebrated Neptune's incredible acts of bravery, devotion, and love. Mr. Pullen asked the King and Small family descendants to stand to be recognized. As I stood and shared that moment with the Small family, I could not help but think about the racial challenges we have today in Brunswick and so many communities around the country. For a moment, we soaked in heartfelt applause and shared hugs and smiles, and our two families celebrated a common bond. Neptune’s journey home and his love and devotion to his fallen friend represents a unique part of the history of St. Simons Island. After the war, as a means of appreciation for his devotion and years of faithful service, Neptune was gifted a tract of land then owned by the King family. Part of that property given to Neptune is now known as Neptune Park in the Pier Village. This now beloved park, along with the beautiful sculpture of Neptune holding King’s body, help to memorialize this amazing St. Simons Island story.